The content focused on the “bulls of Bashan” and the conquest of Bashan (Psalm 68 in Ephesians 4). 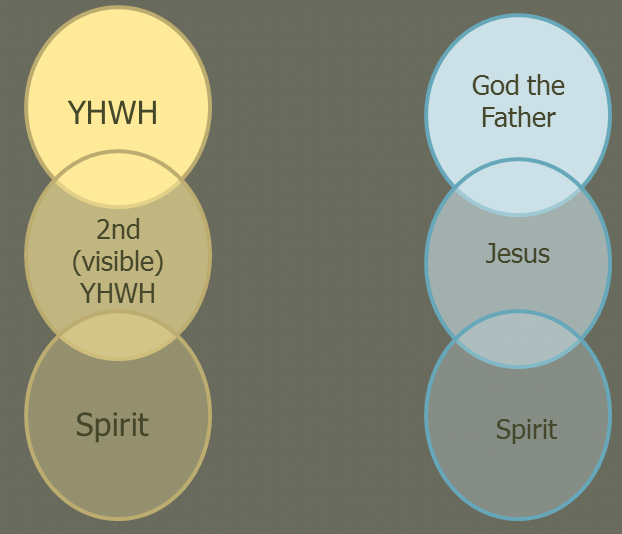 The relationship of the two powers (two Yahwehs) teaching to the Spirit in the New Testament was also view. For an example of how the Spirit is described / blurred with either (or both) of the two Yahwehs, see my notes on this website under Chapters 16-18. See below for further comments on how New Testament writers re-purposed the two Yahwehs to articulate a Trinitarian theology. J. Williams, “A Further Suggestion about Amos 4:1-3,” Vetus Testamentum 29 (1979):206-211. Acts 16:6 And they traveled through the Phrygian and Galatian region, having been prevented by the Holy Spirit from speaking the message in Asia. 7 And when they came to Mysia, they attempted to go into Bithynia, and the Spirit of Jesus did not permit them. Romans 8:9 But you are not in the flesh but in the Spirit, if indeed the Spirit of God lives in you. But if anyone does not have the Spirit of Christ, this person does not belong to him. 10 But if Christ is in you, the body is dead because of sin, but the Spirit is life because of righteousness. Philippians 1: 19 for I know that this will turn out to me for deliverance through your prayer and the support of the Spirit of Jesus Christ . . .
Galatians 4:4 But when the fullness of time came, God sent out his Son, born of a woman, born under the law, 5 in order that he might redeem those under the law, in order that we might receive the adoption. 6 And because you are sons, God sent out the Spirit of his Son into our hearts, crying out, “Abba! (Father!)” . . .
1 Peter 1:10 Concerning this salvation, the prophets who prophesied about the grace meant for you sought and made careful inquiry, 11 investigating for what person or which time the Spirit of Christ in them was indicating when he testified beforehand to the sufferings with reference to Christ and the glories after these things . . . The point is that, as the New Testament writers assigned the epithets, relevant passages, and imagery associated with the second Yahweh to Jesus, thus interchanging him with the Father, when they further interchange the Spirit and Jesus, the result is a triune Godhead.